During community consultation regarding the forest, the number one wish was for a local split-log supply which we are now in the second year of providing. In terms of recreation within the forest, a great base of volunteer workers has established a barbeque and picnic area with a path leading down to the forest school area: another example of a great community benefit. All of Scotland’s 93 island communities face distinct challenges relating to their geographic remoteness: declining populations, transport and digital connectivity and supporting sustainable economic growth. The Sleat peninsula, located in the south of the Isle of Skye, is home to one of the fastest-growing rural areas of Scotland, with a diverse population of over 800. The Sleat Community Trust was formed in 2004 with the aim of improving the area for the benefit of its inhabitants by safeguarding Sleat’s spectacular natural environment and by promoting economic development. In 2007, the Trust purchased the local petrol station and has since developed this vital local asset so that it now includes a Post Office and shop. 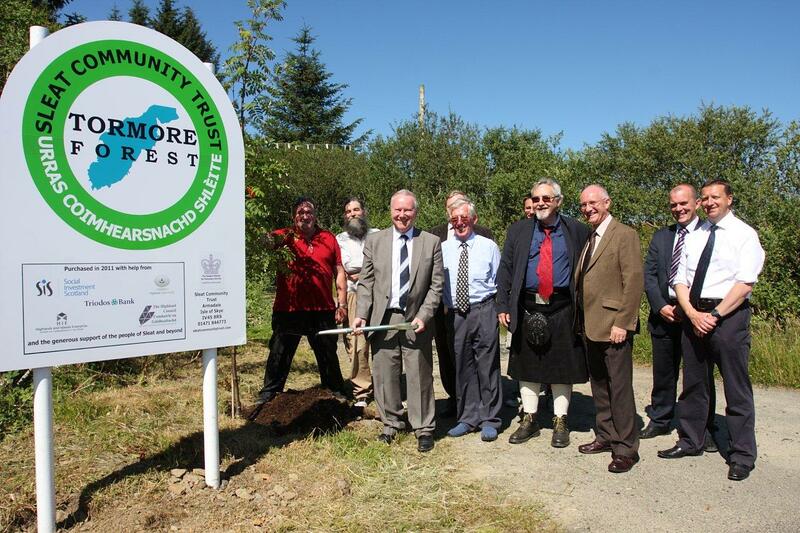 In 2011 the Trust, with SIS investment, led the community purchase of the 1,000-acre Tormore Forest, which now provides a source of sustainable woodchip energy to the local area. Many of Skye’s residents struggle to access high quality broadband and are unlikely to benefit from the upcoming rollout of superfast broadband. Therefore, and with further SIS support, the Trust developed and launched Skyenet, a community broadband scheme. Using a network of masts, Skyenet now provides broadband services to residents across Sleat and is set to expand in the near future. “When we moved here in 2005, one of the first utilities I checked was broadband, and BT assured me that it was available. That was, of course, a lie and what followed was years of slow unreliable dial-up, promises and then expensive limited satellite systems. In the twenty-first century it seemed that a utility taken for granted in far-flung wildernesses was beyond the reach of the Highlands of Scotland. And then in 2014 there was light at the end of the tunnel. Sleat Community Trust was awarded the funds to set up Skyenet and in 2015 we were connected, not just to the system but to the world. The installation was quick, efficient and inexpensive, done by a local company. The support is superb, the service is reliable and the speed, while not mind­blowing, is adequate for most needs. I am able to run my holiday-letting business now which would be almost impossible these days without fast internet access. My guests can access it which, no matter how much people say they want to unwind on holiday, is essential. In addition to the demands of business, we are connected to the many joys of modern entertainment. Who could live without Netflix? !